In these twelve monthly articles about Control Room Management (CRM), I have provided a perspective on all sections of the CRM rule and how companies can comply with the rule, the FAQS, the inspection questions, the applicable Advisory Bulletins, and NTSB reports that have relevance for control rooms. In our work with multiple companies between 2008-2015 on over 200 CRM projects, we have seen many approaches to regulatory compliance. Some companies seek minimal compliance and take a simplistic approach to their interpretation of the regulations. Others do not carefully study the regulations and associated documents, and then plead ignorance about their lack of compliance. Some complain and whine about the burdens imposed by the pipeline safety regulations. Some companies seek to go beyond compliance and instill regulatory compliance as one of its company values and a part of the business. A select few companies have standards of excellence for their CRM plans and all aspects of their control room operations. Some companies change their approach to regulatory compliance after an accident, when they could have prevented the accident by complying before the accident. What is your personal philosophy and company philosophy for operations, safety, and regulatory compliance? We prefer to work with companies who want a CRM program that is written and implemented to improve control room operations and to comply with the regulations and all associated regulatory documents. Compliance requires ongoing attention to detail and continuous learning from company, industry, and regulatory experience. If you read the monthly articles, you have lessons to apply from accidents, regulatory enforcement actions, and the experiences of Pipeline Performance Group. Ali Gibson developed a service we call “Compliance Assurance Solutions” and several companies in the USA and Canada are benefitting from regular onsite and offsite work by our consultants who assess/audit compliance and provide recommendations for continuous improvement. At the time of the inspection, Non Identified Company (NIC) procedures for compliance validation did not include a log to document CRM plan requests and the operator ‘s response to the requests and did not include the date of the request of the submittal and to whom the plan is submitted. Procedures did not ensure that the documentation of deviations applies to all aspects of the CRM plan. Procedures did not provide sufficient detail to know how documentation of deviations will be pulled together for future reference. Procedures did not include information about the various electronic record storage media and associated durations. At the time of the inspections, procedures did not ensure that deviations must be required as a result of pipeline safety considerations or that the reason for the deviation regarding pipeline safety impact is documented or ensure routine and cyclical deviations are addressed in the CRM manual. NIC did not have adequate procedures that defined the roles of the personnel responding to regulatory agency requests. NIC did not have adequate procedures that required documentation of any deviations from the CRM plan and that deviations can only be performed when it is required for the safe operation of the pipeline. NIC’s written control room management procedures were inadequate because the procedure addresses data storage as a process, but does not explicitly address the level of detail to be retained in the records as prescribed in §192.631G)(1). 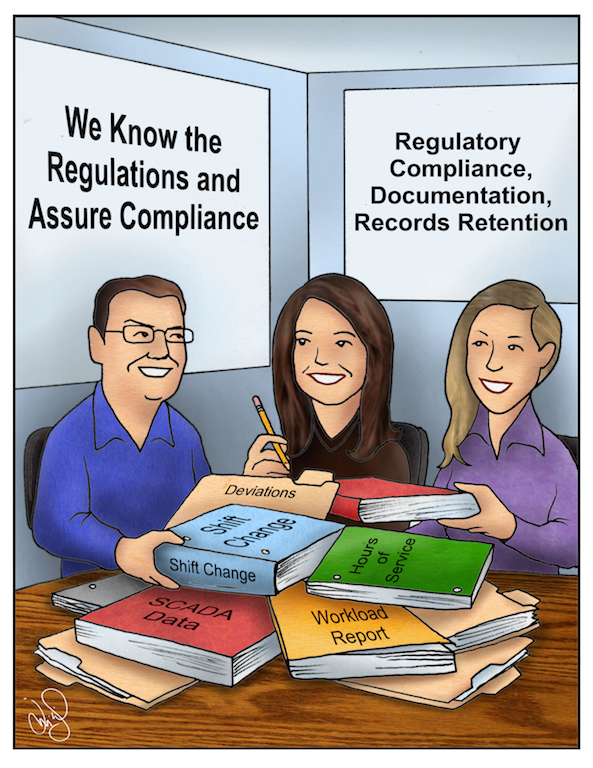 The CRM plan needs to amend procedures to demonstrate how records will be managed and maintained to support compliance. The CRM plan needs procedures to demonstrate and provide a documented record that every deviation from any CRM rule requirement was necessary for safe operation. The CRM Plan needs to address who the responsible individual is carrying out requests. The CRM Plan needs procedures to demonstrate and provide a documented record that every deviation from any CRM rule requirement is necessary for safe operation. At the time of the inspection, NIC’s procedures for compliance validation did not include a log to document CRM plan requests and the operator’s response to the requests in section 8.0. NIC’s procedures did not include the date of the request to submit their plan, the date of the plan submittal, the person’s title responsible for submitting the plans, and the person to whom the plan is submitted. NIC’s procedures for compliance and deviations as presented had a number of areas where PHMSA noted deficiencies in the procedures reviewed with respect to the requirement that operators must maintain for review during inspection, records that demonstrate compliance with the requirements of this section. NIC must amend their procedures to address each issue as identified below. NIC’s procedures did not ensure that the documentation of deviations applies to all aspects of the CRM plan, not just fatigue and hours of service. NIC’s procedures did not provide sufficient detail to know how documentation of deviations will be pulled together for future reference. NIC’s procedures did not include information about the various electronic record storage media and associated durations (Tape drive, on SCADA system live data retrieval, Idrive, email storage) are utilized as described verbally during the inspection. At the time of the inspection, NIC’s procedures did not ensure that deviations must be required as a result of pipeline safety considerations or that the reason for the deviation regarding pipeline safety impact is documented or ensure routine and cyclical deviations are addressed in the CRM manual. NIC does not have a sufficient process developed for providing procedures to PHMSA or their state partners upon request. This process must include accountability aspects. A formal process for tracking these requests including logging their current status and the completion dates versus data requested must be developed in order to demonstrate compliance with this section of the rule. The formal process should require that all requests be addressed in a timely fashion and completed by requested deadlines. As part of the formal process, a step shall be included that requires all requests that are not provided in a timely fashion, exceed the requested deadlines, or do not comply with the developed procedure must be placed in the deviation log. Non Identified Company (NIC) CRM procedures did not describe safeguards used for protecting electronically stored records from loss or damage. As required by § 195.446 (j) (1) and (j) (2), NIC must maintain records that demonstrate compliance with requirements of § 195.446. Any deviation form the procedure required by this section that was necessary for the safe operation of the pipeline facility must be demonstrated. Because NIC control room management program is heavily dependent on electronically stored records, NIC must have a process of protecting the integrity of those electronic records. NIV must amend their CRM procedures to include what measures NIC takes to protect the integrity of their control room management electronic records. If you have read these articles this year, I would appreciate your feedback on whether or not they have been helpful to you and your control room personnel. E-mail charles@pipelineperformancegroup.com.